The imperative of sciō is scītō in the singular and scītōte in the future. These are the future forms, but they are used in the present tense. Scītōte vobīs semper deum propitium esse, sī bonīs: Know that the god will always favor you, so long as you are good. Scītō tibi gratiās dābō: trust that I will return the favor. Scītō exemplum tuī patris: recall the example of your father. This is also true of habeō, where it means understand, and mēminī. Habētō tibi me nōn irātum esse: realize that I am not angry with you. Habetōte vostrum finem: know your limits. Mementō ora candentia parentis: recall your mother’s glowing features. From the examples in Lewis and Short, I cannot be sure, but it appears that the imperatives of sciō will always take a direct object or an infinitive construction, and never the dē + ablative construction that may appear with other moods of sciō. The Essential A & G: 182a. Somewhere in Latin class, you likely came across the most common irregular imperatives: dīc, fer, dūc, fac — Speak, Carry, Lead, Do. I repeat them in this order to recreate the mnemonic DFDF, SCLD — Dufus! Dufus! Scold him!, which I was introduced to early on. What you might not know is whether these irregular forms are maintained within compounds. Indeed, they are, with one exception. Cōnfer haec exempla: compare these examples. Infer tribūtum reditūs foederāle semel in annō: pay your federal income taxes once a year. Eam addūc ut moveat: persuade her to move. Dēdūc maiōrīs verbīs fābulam: expand on your story with more words. Maledīc donec potes: curse them while you still can. The exception is therefore fac, which is derived from faciō, a verb that more often than not takes its compounds in –ficiō. Such compounds do not display an irregular imperative. Effice tria carmina: complete three poems. Infice regem priusquam cīvēs cōnficiat: poison the kill before he kills the citizens. If you’d like a refresher on the plurals: cōnferte, addūcite, maledīcite, facīte, efficite, etc. Also, note that early late features the occasional face, dūce, and dīce (but never fere). The Essential A & G: 182. Like A&G, I would like to conclude my series on i-stems with a short assessment of the basic rules and variations associated with the i-stem class. A&G paint a picture of cultural amnesia regarding Roman relations with the i-stem. As I have shown in previous posts, in all but the genitive plural (ium), and the neuter accusative/nominative plural (ia), the unique i-stem endings are rare or optional. (cf. the status of English ‘who/m’). The nominative singular could be -is (sitis, is) but also ēs/-s/–x, etc. The accusative singular could be -im but also -em. 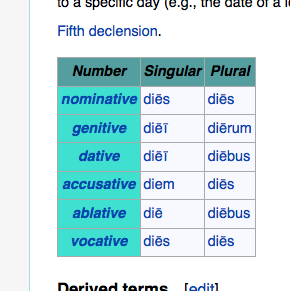 The ablative singular could be -ī or it could be -e.
The accusative masc/fem plural might be -īs but it’s usually -ēs. We see that -im and -ī tend to be common in the same words. That is, where -im is of frequency, so too is -ī. For more on where the -im ending shows up, see this post. The case defective māne (morning) is sometimes mānī (the word is found only in the ablative).